Not long after my kids received their copy of The Polar Express with its read-along CD, I discovered Lorito Books. At the time, it was a new company that had just launched its collection of audiobooks. I'm happy to say that they have done well despite the sluggish economy, and have, in fact, really grown over the past year. The company's president, Pam Fochtman, saw a need in the community for these materials. The company is committed to developing second language literacy and promoting the beauty of Latino culture. And they believe that audiobooks are a valuable tool to accomplish these goals. Their high quality, word-for-word audiobook read-alongs for young readers and second language learners are carefully chosen for their culturally relevant content and values. Their products include Growing Up With Tamales/Los tamales de Ana, The Desert is my Mother/El desierto es mi madre, Icy Watermelon/ Sandía fría and other popular titles in Latino children’s literature. I've had the pleasure of reviewing several of their books with CDs through the Latin Baby Book Club, and I especially appreciate how Pam has chosen native speakers - who just happen to be outstanding storytellers - to record the books. You can learn more about the narrators on the Lorito Books website. Pam has generously offered two of her new releases as giveaways for MommyMaestra. 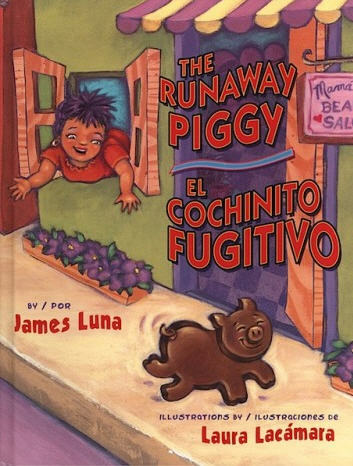 The Runaway Piggy/El cochinito fugitivo is a bilingual takeoff on the gingerbread man story. It's full of the sounds and people that make up a traditional Latino neighborhood. There is a cochinito cookie recipe included in the back of the book and even comes with piggy cookie cutters! You can listen to some audio samples here, or learn more about the story here. Older readers will enjoy The Case of the Pen Gone Missing/El caso de la pluma perdida. 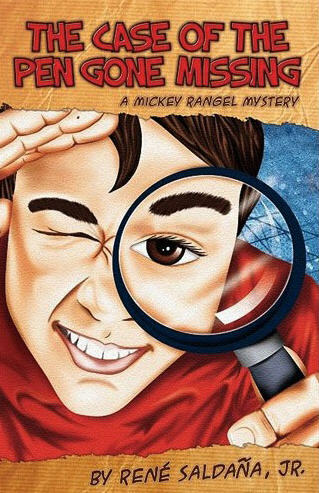 The character is a Latino "Encyclopedia Brown" who gets tongue-tied when the most popular girl in school asks him to solve a mystery. It's very sweet. You can read a review of this book on the Latin Baby Book Club. Brian Amador of Sol y Canto is the narrator. This book is available as either a stand alone audiobook or a book + CD set. You can hear an audio sample here. Two MommyMaestra readers will receive a copy of one of the books with CD. To enter to win, simply leave a comment below letting me know which book you'd like to win. The deadline to enter is 11:59 EST, Monday, January 23rd. The winners will be chosen using Random.org and contacted via email - so be sure to leave a valid email address in your comment! 1) Visit Lorito Books' website, then come back and leave a comment telling me which audiobook you'd like to hear most. I'd like to win the Cochinito Fugitivo book! I went to the website for Lorito books, and I've actually read many of the books before. But I'd like to hear the Tamales de Ana most - it sounds like a great story and with an actress reading it, too! Just visited Lorito Books and have bookmarked their website to purchase additional audiobooks for my Spanish Tutoring sessions. Excited to use these! Looking forward to winning El caso de la pluma perdida; I used to read/watch Encyclopedia Brown and this would be great for my kids to listen/read. Already a fan of yours via FB! Thanks for all that you're doing to help us raise bilingual kiddos! Just tweeted about your awesome giveaway! I'm @cecyhdz2 on Twitter. Ajua! I love all your giveaways!!!! I would like el cochinito fugativo! I'd love to win the cochinito fugativo...my daughter woke up this morning with a note written to me saying, "I want to learn Spanish quickly." I'm definitely not doing enough...this would be great for her! I follow you on FB...and love your updates! I checked out the website. All the books look great! I would love El Caso de la Pluma Perdida. As a mom to bilingual boys, I know that they would eventually love this book. As a high school Spanish teacher, I could use this in my class now. My native speakers would especially love it. My email stephan_so@yahoo.com. Quiero El cochinito fugitivo!!! Tan lindo el cuento! I am a FB fan of MommyMaestra. What a wonderful giveaway! I would love to win El Caso for my two boys.